Okay, so are you packed? Carol and I leave for Nigeria on the 22nd, and I go on from there to Ghana on the 28th, while she returns home. People ask me, “How do you prepare for a trip like this?” Actually, that’s literary license, nobody asks me that. But the question allows me to admit that I do shamefully little. I know some folks immerse themselves in history, politics, culture of the countries they travel to. I’m lucky if I read a book or two, often a novel, this time Half of a Yellow Sun. On this trip, there’s been a fair amount of preparation in talking to the four friends we’re traveling with, of which more later. The information I’ve presented below is material that I’ve stolen and edited from a very few sources, mainly Wikipedia. I hope it provides some useful background, but if it’s too much, just skim or skip around. Nigeria, officially the Federal Republic of Nigeria, is a federal constitutional republic comprising 36 states and its Federal Capital Territory, Abuja. The country is located in West Africa and shares land borders with the Republic of Benin in the west, Chad and Cameroon in the east, and Niger in the north. Its coast in the south lies on the Gulf of Guinea on the Atlantic Ocean. There are over 250 ethnic groups in Nigeria of which the three largest ethnic groups are the Hausa, Igbo and Yoruba. The country is larger in area than Texas. The name Nigeria was taken from the Niger River running through the country. This name was coined by Flora Shaw, who later married Lord Lugard, a British colonial administrator, in the late 19th century. Nigeria was formed as a result of the amalgamation by Lord Lugard of the northern and southern British protectorates around the Niger River. The British colonized Nigeria in the late nineteenth and early twentieth century, setting up administrative structures and law while recognizing traditional chiefs through a system known as indirect rule. 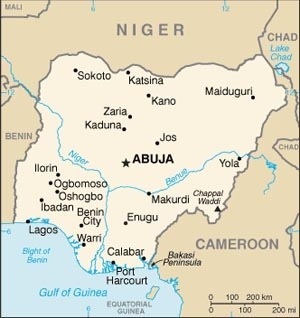 Nigeria became independent in 1960 and became a Republic in 1963. Several years later, between 1967-1970, it had a civil war as Biafra tried to establish independence. Military governments, through coups, have alternated with democratically elected governments. Known as “the Giant of Africa”, Nigeria is the most populous country in Africa and the seventh most populous country in the world. Nigeria is roughly divided in half between Christians, who mostly live in the South and central parts of the country, and Muslims, concentrated mostly in the north. The country is also approximately half rural and half urban. A minority of the population practice traditional and local religions, including the Igbo and Yoruba religions. Its oil reserves have brought great revenues to the country. It is listed among the “Next Eleven” economies. Nigeria is a member of both the Commonwealth of Nations, and the African Union. Since 1986, it has been a member of the Organisation of Islamic Cooperation. One out of every six Africans is Nigerian. Presently, Even conservative estimates conclude that more than 20% of the world’s black population lives in Nigeria. According to the United Nations, Nigeria has been undergoing explosive population growth and one of the highest growth and fertility rates in the world. By their projections, Nigeria is one of eight countries expected to account collectively for half of the world’s total population increase from 2005–2050. By 2100 the UN estimates that the Nigerian population will be between 505 million and 1.03 billion people (middle estimate: 730 million). In 1950, Nigeria had only 33 million people. Present estimates of population range rather widely, but may exceed 165 million. Nigeria’s largest city is Lagos. Lagos has grown from about 300,000 in 1950 to an estimated 15 million today (some sources put this number considerably lower), and the Nigerian government estimates that city will have expanded to 25 million residents by 2015. On 1 October 1960, Nigeria gained its independence from the United Kingdom. Nigeria’s government was a coalition of conservative parties: the Nigerian People’s Congress (NPC), a party dominated by Northerners and those of the Islamic faith; and the Igbo and Christian-dominated National Council of Nigeria and the Cameroons (NCNC) led by Nnamdi Azikiwe, who became Nigeria’s second Governor-General in 1960 and President in 1963. Forming the opposition was the comparatively liberal Action Group (AG), which was largely dominated by the Yoruba and led by Obafemi Awolowo. The cultural and political differences among Nigeria’s dominant ethnic groups: the Hausa (‘Northerners’), Igbo (‘Easterners’) and Yoruba (‘Westerners’), were sharp. The disequilibrium and perceived corruption of the electoral and political process led in 1966 to first of several back-to-back military coups. The violence against the Igbo increased their desire for autonomy. By May 1967, the Eastern Region voted to declare independence as a state called the Republic of Biafra, under the leadership of Lt Colonel Emeka Ojukwu. The Nigerian Civil War began as the Nigerian (Western and Northern) side attacked Biafra (South-eastern) on 6 July 1967 at Garkem. The 30 month war, with a long siege of Biafra and its isolation from trade and supplies, ended in January 1970. Estimates of the number of dead in the former Eastern Region are between 1 and 3 million people, from warfare, disease, and starvation, during the 30-month civil war. The new head of state, Ibrahim Babangida, declared himself president and commander in chief of the armed forces and the ruling Supreme Military Council. He set 1990 as the official deadline for a return to democratic governance. After Babangida survived an abortive coup, he pushed back the promised return to democracy to 1992. Free and fair elections were finally held on 12 June 1993, showing a presidential victory for Moshood Kashimawo Olawale Abiola. Babangida chose to annul the elections, leading to mass civilian violent protests which effectively shut down the country for weeks. This forced Babangida to keep his promise to relinquish office to a civilian-run government, but not before appointing Ernest Shonekan as head of the interim government. Babangida’s regime has been considered the most corrupt, and responsible for creating a culture of corruption in Nigeria. Shonekan’s caretaker regime was overwhelmed in late 1993 by the military coup of General Sani Abacha. Abacha oversaw brutal rule using violence on a wide scale to suppress the continuing civilian unrest. He shifted money to offshore accounts in various western European banks and voided coup plots by bribing army generals. Several hundred million dollars in accounts traced to him were discovered in 1999. The regime came to an end in 1998 when the dictator was found dead amid questionable circumstances. His successor, General Abdulsalami Abubakar, adopted a new constitution on 5 May 1999, which provided for multiparty elections . Nigeria regained democracy in 1999 when it elected Olusegun Obasanjo, the former military head of state, as the new President of Nigeria ending almost 33 years of military rule (from 1966 until 1999) excluding the short-lived second republic (between 1979 and 1983) by military dictators who seized power in coups d’état and counter-coups during the Nigerian military juntas of 1966–1979 and 1983–1998. Although the elections which brought Obasanjo to power in 1999 and again in 2003 were condemned as unfree and unfair, Nigeria has shown marked improvements in attempts to tackle government corruption and to hasten development. Ethnic violence over the oil producing Niger Delta region and inadequate infrastructures are some of the issues in the country. Umaru Yar’Adua of the People’s Democratic Party (PDP) came into power in the general election of 2007 – an election that was witnessed and condemned by the international community as being severely flawed. Nigeria is the 12th largest producer of petroleum in the world and the 8th largest exporter, and has the 10th largest proven reserves. The country joined OPEC in 1971. Petroleum plays a large role in the Nigerian economy, accounting for 40% of GDP and 80% of Government earnings. However, agitation for better resource control in the Niger Delta, its main oil producing region, has led to disruptions in oil production and prevents the country from exporting at 100% capacity. Nigeria has one of the fastest growing telecommunications markets in the world, major emerging market operators (like MTN, Etisalat, Zain and Globacom) basing their largest and most profitable centres in the country. Before the oil boom, agriculture used to be the principal foreign exchange earner of Nigeria. At one time, Nigeria was the world’s largest exporter of groundnuts, cocoa, and palm oil and a significant producer of coconuts, citrus fruits, maize, pearl millet, cassava, yams and sugar cane. About 60% of Nigerians work in the agricultural sector, and Nigeria has vast areas of underutilized arable land. Health, health care, and general living conditions in Nigeria are poor. Life expectancy is 47 years (average male/female) and just over half the population has access to potable water and appropriate sanitation. Nigeria suffers from periodic outbreaks of cholera, malaria, and sleeping sickness. It is the only country in Africa to have never eradicated polio, which it periodically exports to other African countries. A 2004 vaccination drive, spearheaded by the W.H.O. to combat polio and malaria, met with some opposition in the north, but polio was cut 98% between 2009 and 2010. Education is in a state of neglect. After the 1970s oil boom, tertiary education was improved so that it would reach every subregion of Nigeria. Education (base tuition only) is provided free by the government, but the attendance rate for secondary education is only 29% (32% for males, 27% for females). The education system has been described as “dysfunctional” largely because of decaying institutional infrastructure. 68% of the population is literate, and the rate for men (75.7%) is higher than that for women (60.6%).